Editor’s note: The trial of the killers of 27-year-old Farkhunda is underway in Kabul. In the first week of trial, four men were sentenced to death and eight sentenced to prison. The Primary Court judge found many of the 49 accused to be innocent and released them from jail. He then ordered police to arrest additional individuals who were not initially detained in the March 19 mob killing. We Afghan women all have different stories, yet our stories are also often the same. Today, because of media technology, we can watch the evidence of Farkhunda’s violent death at the hands of a mob. What if every one of us had a video showing the things that happen to us? We saw Farkhunda beaten, mobbed, killed, and burned. In another province we see women traditionally burned first. Then they die. Throughout Afghanistan, we see young girls escaping from violence at home, and then being sent to prison for escape. The dramatic stories are all around us. There is nowhere for us to run, no place where we are safe from violence of one kind or another. My pen cannot dare to write the details I see in the videos of Farkhundas’s death. Her death was a show of cruelty, inhumanity, and the wildness of Afghan men. It showed how society is sinking deep in rubbish beliefs. It represents a society absent of God. 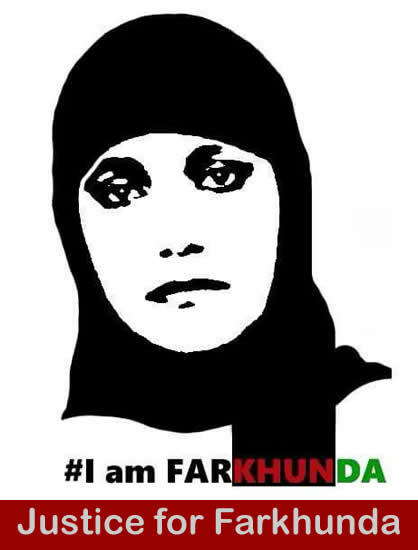 Someone who knows who God is, would not have killed Farkhunda in defense of our Qur’an. Farkhunda was a religious girl and the evidence shows she didn’t burn the Qur’an. She may have burned a piece of paper. But what if she had burned the Qur’an? Would the Qur’an seek her death? I learned many lessons from this. I understood that the people who killed Farkhunda think they will get their reward from God. So where does this violence against Afghan women come from? It doesn’t exist by itself. It has roots. Someone grows it for us; someone benefits from it. I believe the violence comes from our religious thoughts, as they are being represented by men. It starts in the mosques where the mullah talks about women’s issues. When talking about women, the mullah changes his tone of voice, opens his mouth wide to shout, and complains about the behavior of women in Afghanistan. This mullah is not satisfied with the violence women already suffer. He wants to crank it up. So he warns his male congregation in the mosque to exert more control. He chooses what women can wear. He picks his favorite dark color. He encourages the bravery of the people who will beat me, pull off my veil, kill me and burn me. Farkhunda is not the only woman to suffer such a fate. So many Afghan woman don’t even have basic human rights at home; they tolerate physical abuse daily but keep silent. We are not safe at home and we are not safe outside. We are mentally abused by men’s eyes on us, their insults, their judgments. Women become the champions of tolerance and superstars of silence. We keep silent because we don’t want to die. We keep hoping the situation will change. But by doing this we also give them more chances to abuse us. We’re saying, “I am fine. I can tolerate what you want to do.” But now, it is enough. We must not tolerate violence. We must not just cope with it, but fight to remove its roots. We must start now. I say to the mullahs now that women are not donkeys. You cannot drive us and lead us. You can’t sign our deaths. You must cleanse your head and your thoughts and your mouth before you speak of Afghan women. We are awakened and we know what is right and what is wrong. We fight to teach you the meaning of kindness and values of life. We won’t murder you the way you killed Farkhunda or punish you the way you punish us. We won’t smother you with hate and hide you in the corner of the kitchen. But we will stop you. We want to end your violence, your barbarism. I promise with my voice. My voice is my action. We call for justice for Farkhunda and for every Afghan woman who has suffered and continues to suffer. Forty-nine people were accused in Farkhunda’s case in court last week. Many people want to see them dead, although this is not what the judge has decided. Four of the killers have been sentenced to death and eight to prison. Many of the accused seen in the videos have been found innocent, and some of the killers have not been arrested. I feel pity for my country, for the violent geography in which women live. I also feel sorry for the families of the killers. It is sad to be born in such ignorance, to live in it and to die in it. We respond to blood with blood; we end violence with violence. This is our justice, unfortunately. I ask myself, will my Afghanistan be able to change for a better tomorrow? Pari, this is one of the most powerful writings I have read. Farkhunda’s story is every Afghan woman’s story. You say what must be said, with equal measures of heart and anger: “We won’t murder you the way you killed Farkhunda or punish you the way you punish us. We won’t smother you with hate and hide you in the corner of the kitchen. But we will stop you.” I have hope because of women like you. Dear Pari: My goodness, this essay. I agree with Jill – just shakes up a reader. Feeling this strongly because we have our own parallels in the US when it comes to police brutality–and honestly, brutality of all kinds. The horror of it, felt. May this essay be translated into multiple languages, read around the world, and read on the radio. Brava, Pari. Brava. Pari, I have said it before: this essay is just fantastic. So honest, so beautifully written. You are an activist and an artist.